Location: Montbrun, in the Meurthe-et-Moselle departement of France (Lorraine Region). Notes: The castle of Montbrun is a castle located in Montbrun, France.The fief belongs to the family of Gourdon. In 1223, Bertrand de Gourdon cedes the fief of Montbrun to Dorde or Déodat de Barasc, lord of Béduer. Deodat of Barasc died in 1231 and transmits the fief to his son Deodat II. He died after 1271, transmitting three-quarters to his son Deodat III, and the rest to his daughter married to Hugues d'Arpajon whose son, Béranger d'Arpajon, exchanged in 1315 against other possessions with the king of La France. On the death of Deodat III of Barasc in 1286, Lombarde de Balaguier, his wife, receives the third, Arnaud de Barasc, his brother, receives the second third, the rest is divided between his two nieces, daughters of Raymond de Barasc. The two nieces have an agreement with their Aunt Lombarde and no longer appear in the history of the castle. Lombarde de Balaguier transmits his share to his sister Douce de Balaguier married to Bernard Hugues de Cardaillac-Varaire. In 1299, Douce de Balaguier died. His son, William II of Cardaillac-Varaire, exchanged his share of the seigniory with the King of France in 1317. The King of France gives his share of the seigniory of Montbrun to the Count of Evreux who sells it to Pierre Duze, brother Of Pope John XII. Arnaud Duèze, Viscount of Carmaing, inherits part of the castle and sells it in 1333 to Hugues III de Cardaillac-Brengues, his cousin. The part of the seigneury received by Arnaud de Barasc was transmitted to his two sons, Arnaud and Raymond. Raymond de Barasc gave his share to his nephew, Déodat de Bouyssou, who sold it in 1342 to Marquès II de Cardaillac-Brengues (circa 1320-around 1405). His brother, Arnaud de Barasc married to Anne de Melun, had a daughter, Hélène, married in 1312 with Géraud de Montal. Their daughter, Isabelle de Montal, married in 1342 Marques II de Cardaillac-Brengues allowing this family to reunite the whole seigniory in one hand. 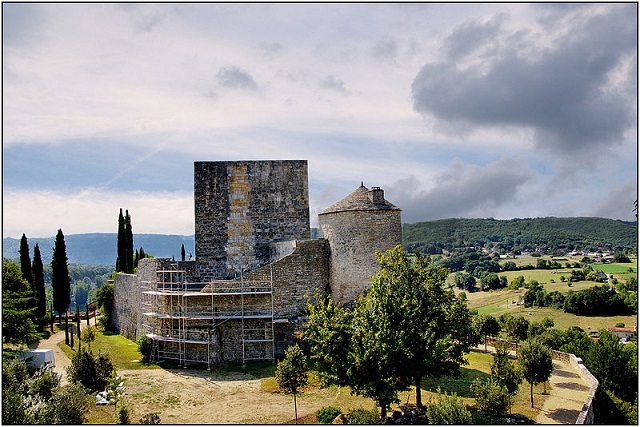 During the Hundred Years' War, in 1362, the castle was taken by the trucking company commanded by Raymond de Sort (called Romonet), a native of the Landes, who said he was nephew of Bertucat d'Albret, in the pay of the English. The castle was delivered by the Count of Armagnac in 1396. The building, raised from ruin in the aftermath of the war. It was burnt down in 1578 during the religious wars. Marguerite de Cardaillac-Brengues is the heiress of the seigniory. She married François de Suzanne in 1563. The seigniory was sold in 1616 by their son Jean de Suzanne to Jacques de Laurency, ordinary gentleman of the King's Chamber, adviser to the King in his Councils of State and private, adviser to the Queen Mother, vigouier of Figeac between 1608 and 1625. His only son, Jean Louis de Laurency, married to Marie Thérèze Fleuriot, saw the seigneury elevated to the rank of marquisate by letters patent in September 1681. The Laurentians had a south-facing terrace under which they had created a widely open room On the valley which allows to see the broad cingle of the valley and the circus of the Saut de la Mounine on the opposite bank of the Lot. Having had no heir, he transferred the seigniory to his sister, Marie Eléonore de Laurency, married in 1662 with François de La Prune, owner of the neighboring castle of Salvagnac-Cajarc. The La Prune preserved the castle until the Revolution, but they lived in the castle of Salvagnac, abandoning the castle of Montbrun. At the time of the Revolution, the castle was seized as a national property and sold on 18 Ventôse, year VI. It seems to have been bought by straw men because it quickly finds itself in the hands of the Jammes family which kept it until 1965 but without maintaining it. The building is classified as a historic monument on 28 December 1984.